There is nothing to bring people together like the spirit of competition, and no more traditional a display of competition than a live sporting event! While we don't have any NFL, NBA, MLB, or NHL teams (yet), Las Vegas is still a great venue to enjoy and participate in some private sporting events for your group! 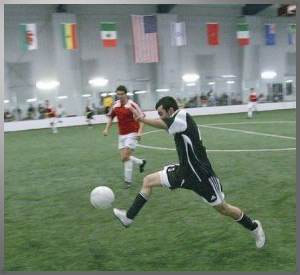 Unique venues like the Las Vegas Indoor Soccer Complex are fantastic options for a little friendly competition between regions or departments of your organization, where after the big game, we can celebrate with a dinner right there on the field! A wide array of indoor and outdoor facilities are available throughout town for use, whether it be Soccer, Basketball, Volleyball or Baseball – we can provide the facility, equipment, and personnel to make your group feel like all-stars! Want to get your day started with an early morning kick-start? Whether you want to host a 3 to 5K Fun Run right from the hotel, or an in-house Yoga, Zumba, or Pilates Program, we can plan, organize, and provide top quality professionals to facilitate your event. More the spectator type? Las Vegas is the proud home to the Las Vegas 51's AAA Baseball Team, the Las Vegas Wranglers Professional Hockey Team, and of course all of the amazing talents of the UNLV Runnin' Rebels. Consider getting outside of the standard format for an energizing group activity, and the opportunities are endless!